Valentine is Nebraska's "Cupid Capital" as each year thousands of Valentine greeting cards bearing special cachets are mailed across the nation and to foreign countries on February 14. Long before valentine cards became its namesake's ambassadorship, the early settlement which became the county seat of Cherry County was named in honor of Congressman E.K. Valentine, following his favored election in 1882. In 1890, Fort Niobrara was established to provide military protection to the settlers in the region. Although there was no Indian trouble in the immediate area, the post remained active until 1906. In 1912, a portion of the original Fort Niobrara was set aside as a national game preserve. Its impressive visitors' center features excellent wildlife and natural history displays and historical artifacts from the old fort. Centennial Hall, Nebraska's oldest standing high school, and the Sand Hills Museum and Cherry County Historical Museum each contribute collections sharing the history of the Sandhills area. The newly designated scenic river, the Niobrara River, known as Nebraska's swiftest river, is also considered its finest canoeing water. The 25 mile river segment from Fort Niobrara Wildlife Refuge is the most popular area with canoeists. 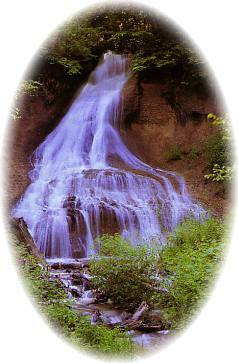 Several falls and cascades include Smith Falls, the tallest falls in Nebraska, tumbling 75 feet. Outfitters and Trail Rides allow you to see the Niobrara Valley like you've never seen it before! Add a trail ride to your canoeing experience and enjoy scenic beauty unlike anywhere else. Highway 20 from Valentine past Harrison has been designated an official Nebraska Scenic Byway. Selected highways showcase Nebraska's diverse scenery, history, and recreational opportunities for visitors and Nebraskans alike to discover and enjoy.